After I finished Her Dark Curiosity earlier this year and found myself with a severe book hangover, I subconsciously made the decision to put off reading the last installment of The Madman's Daughter trilogy for awhile. You know when you are in love with a series and you really don't want it to end so you drag it out for as long as possible? Yeah... But then I kept finding myself completely unable to read anything else! And so I ended up driving to an overpriced bookstore to buy A Cold Legacy minutes before the shop closed. It was the right decision. This was a pretty great end to a pretty great series! 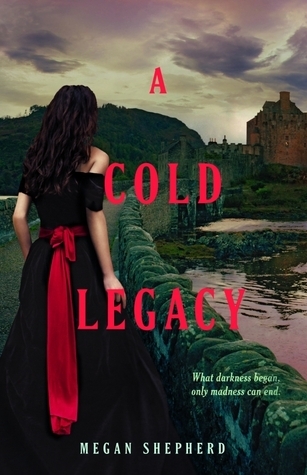 A Cold Legacy picks up right where the last book left off - with Juliet, Lucy, Montgomery, Edward, and Balthazar on the run to Scotland where they will (hopefully) be safe. It's hard to say much about characters that are already so well established in a series other than how much I continued to love them! I loved Juliet's twisted and dark inclinations and how she tries to use them in only the best possible way. She is constantly trying to come to terms with who she is and how she fits into her family. My favorite part of this book is that the love triangle has been completely obliterated! While Juliet still considers Edward to be a dear friend, her devotion to Montgomery is solid in this final book, although there are still struggles there as well as both continue to keep huge secrets from each other. The romance between Edward and Lucy is more fully realized in A Cold Legacy, something the last book only touched on briefly. Edward is honestly the most interesting part of this whole series. He continues to struggle with the beast inside him, trying to do the right thing and keep his loved ones safe. There were some very real feels in this book, mostly owing to the characters and the things they're going through. The minor characters were wonderful also. I loved Balthazar's loyalty to his friends and admired the lengths he'd go to to save those he cared about. The newly introduced staff of Elizabeth's estate were all interesting and most had depth that added to the story, rather than being just a name on the page to fulfill a purpose. Megan Shepherd definitely has a talent for creating sympathetic and REALY characters! The setting of each book in The Madman's Daughter series is different. The first was set on an island, the second in London, and now the characters have found themselves in Scotland. This definitely keeps each book interesting and this one is no exception. I greatly enjoyed exploring the Frankenstein home and learning of each new secret passage! I loved the idea of the booby trapped tunnels and hallways that were not fully known and thereby always a little dangerous. But most of all I thought the (crazy scientist) lab was great! Although almost the entire story is set in the same house, all of these elements made it plenty interesting. Finally, the story itself was decently interesting. It was a "retelling" of Frankenstein, but not really. The other two books in the series were retellings of The Island of Doctor Moreau and Doctor Jekyll and Mr. Hyde and I felt like each of those did a fantastic job of reimagining the original story while keeping some original elements. This one, however, was basically a continuation of Frankenstein rather than an actual retelling. The Frankenstein we know and love has come and gone and his creature is off somewhere doing creature things while Elizabeth has taken over the family home. It was certainly interesting, I just don't feel like it was a true retelling. There were also some aspects that seemed maybe a little unrealistic. Nothing I can really point out without possible spoilers, but suffice it to say there were times when the characters did things that I don't know would have happened in real life. The only thing I truly didn't like was the ending. It seemed very unresolved and I wish there was more to clear up what happens next. Even just a novella or something! Overall I really enjoyed the conclusion to this series! Although not every book was a five star book in my opinion, I still HIGHLY recommend this series for anyone who enjoys classics or books with a darker feel.